Author Reza Aslan speaks in Lutkin Hall at an event hosted Thursday by the Muslim-cultural Students Association for Discover Islam Week. Aslan discussed Islamophobia and its current rise in the mainstream. 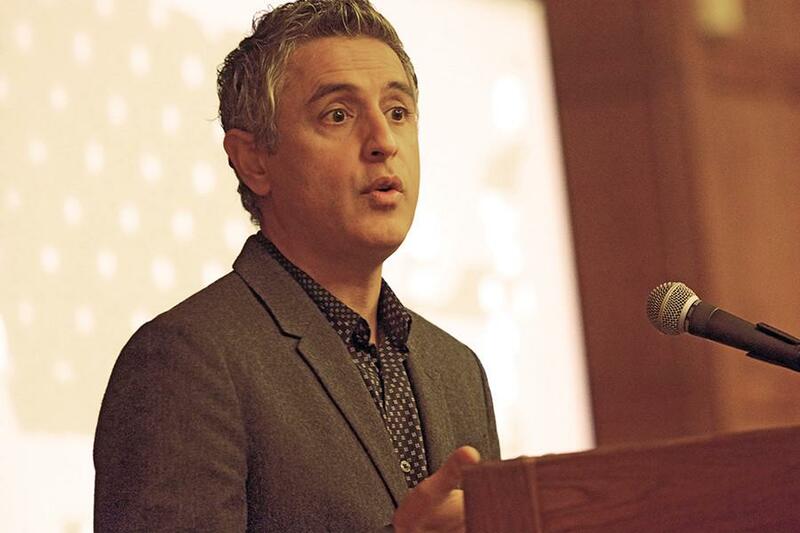 Islamophobia is not a Muslim problem but an American problem, said Reza Aslan at a speech Thursday held by the Northwestern Muslim-cultural Student Association. “Fear Inc: The Industrializing of Islamophobia,” the keynote address of McSA’s Discover Islam Week, featured Aslan, an author and religious scholar. Aslan presented statistics on the rise of Islamophobic acts in the United States and addressed their origins, with a Q&A moderated by political science Prof. Elizabeth Hurd following his speech. Over 400 people attended the event at Lutkin Hall. Recently, Islamophobia has been on the rise, Aslan said. Particularly with presidential elections approaching, many candidates are expressing Islamophobic sentiments unimaginable 10 years ago, he said. While 31 percent of Americans held unfavorable views toward Muslims following 9/11, 61 percent do today, Aslan said. Aslan discussed the role of the media and political figures in making Islamophobic ideas increasingly mainstream. News organizations bring Islamophobia into people’s homes, Aslan said, and allow political figures such as Donald Trump to spread anti-Muslim fears. Conversely, Muslims are among the most law-abiding and peaceful religious groups in the United States, Aslan said. Aslan cited a 2010 Gallup poll that asked participants about the acceptability of the use of violence. In that poll, 78 percent of Muslims said violence is never acceptable, the highest percentage of all religious groups. “If we are involved in an ideological conflict or war of ideas, then we have at our disposal the greatest weapon in that fight: a Muslim community that is integrated and civil and successful and comfortable in their skin and their Americanness,” Aslan said. The origin of Islamophobia is not ignorance, Aslan said, but fear. He said to combat Islamophobia, the same methods used to combat past forces of religious intolerance, from anti-Catholic policies to anti-Semitism, must be employed: building relations. Rimsha Ganatra, vice president for public relations for McSA, said they had been planning the event since the end of Fall Quarter. The Weinberg junior said she was happy with how engaged the audience was throughout Aslan’s speech. “A lot of this (talk) was about meeting a Muslim, getting to know a Muslim, and that’s the point of this whole week as well: just getting Northwestern students to know Muslim students,” Ganatra said. University of Chicago graduate student Salwa Shameem traveled to Evanston to see Aslan, she said.